The ECB and the BoE left the main rates unchanged. ECB President Mario Draghi said that the first rate hike was not discussed. At the end of the month, the share repurchase program will be decreased from 30 billion euros to 15 billion euros. The share repurchase program will continue until the end of this year. If it is no longer necessary, it will come to an end. Growth forecasts for the Eurozone were reduced from 2.1% to 2.0% this year, and from 1.9% to 1.8% in 2019. US data was published during Draghi’s press conference. The inflation report disappointed traders, so the US dollar came under pressure. I conclude that the strengthening of the euro is due to weak data, and not the ECB head’s speech. US CPI was below forecasted expectations, which led to a weakening of the dollar. 12:00 Eurozone: trade balance (Jul). 13:00 UK: BOE’s Governor Carney speech. 15:30 US: retail sales, IPI (Aug). 17:00 US: Michigan CSI (Sep). 20:00 US: Baker Hughes US oil rig count. The fundamental events did not coincide with the weekly forecast. Instead of falling to the level of 1.1576, the euro rose to 1.1701. I warned you that the forecast does not take into account the fundamental events, so during Draghi’s speech, the price could go the other way. Which it did. 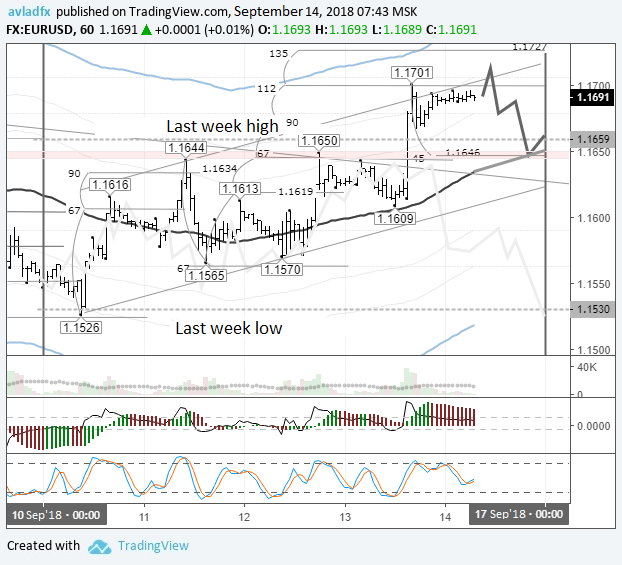 The price broke through the trend line at 1.1733, as well as the high of the previous week – 1,1659. It would be nice to hit a new high to complete the upward movement. The price may rise to 1.1740. Since the price is at the top line of the channel, I limited myself to 1,1715. As soon as a bearish divergence between AO and the price is formed, you can look to enter a short position. To sum up the day, I expect a correction to the balance line at 1.1650.